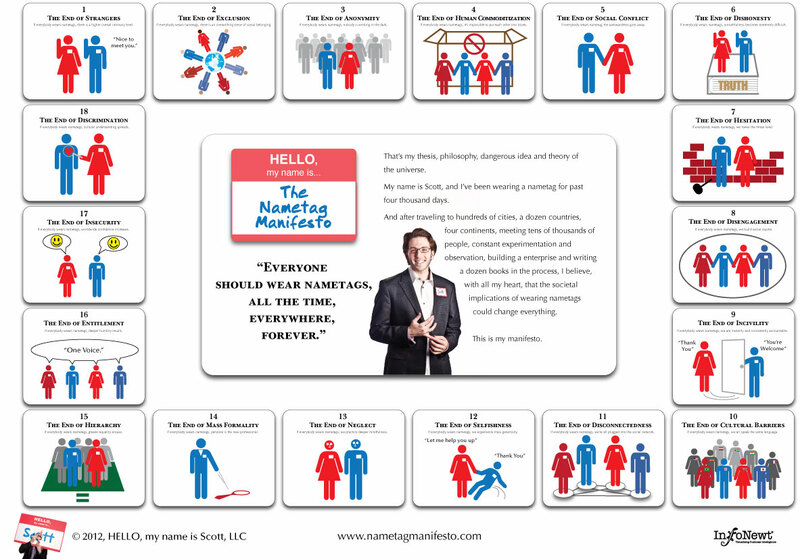 The Nametag Manifesto -- Chapter 11: The End of Disconnectedness ~ HELLO, my name is Blog! If everybody wears nametags, we’re all plugged into the social network. A nametag is an act of humanity in a moment of distance. And these acts allow us to feel a little more connected. Now, we have a constant spark for human contact. We are plugged in without a cord or a signal. We’ve found a way to mitigate loneliness and interact with people face to face in a way that actually resonates with their soul, not just their homepage. This is the real social network. No matter where you go, you never have to feel alone for more than a moment. Because there are always people who know your name; there are always people whose names you know. It’s a constant reminder that nobody is the odd one out. We don’t need friend requests because we’re all in this together, always, forever. If everybody wears nametags, no more fear of missing out, no more eating alone and no more cliques. For the list called, "10 Ways to Help Your Customers Know You," send an email to me, and you win the list for free! Now booking for 2012 - 2013!